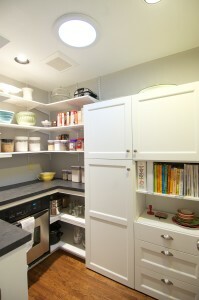 Lighting should be a consideration during any kitchen remodeling project. Lighting is one of many exciting kitchen remodeling trends in 2015. Around age 40 is when we start to notice our vision isn’t what it used to be. By age 60 we’ll need three times the amount of light to accomplish tasks than we needed when we were in our 20s. A mix of natural light from windows, skylights or solar tubes, with layered soft overhead and task lighting can help illuminate while also eliminating glare. LED lighting provides excellent lighting conditions and uses very little energy. This same lighting consideration should also be included in bathroom remodeling plans, since this is where we shave, put on make up and take medications. There are many materials and styles to choose from that require less maintenance to keep clean and are made from eco-safe materials which mean less waste in the landfill and less chemical off-gassing in your home. If a solid slab isn’t in your kitchen remodeling budget, consider using larger tiles which will mean fewer grout lines. Even if they still work fine, old appliances can use a lot of energy and be a killer on your utility bills. Replacing old appliances with ones that are certified by Energy Star can help you save up to 66 percent energy consumption. Saving energy is one of the most popular kitchen remodeling trends because it saves the consumer money. Another energy-saving installation to consider during an interior remodeling project is an on-demand hot water pump. Instead of cold water being dumped from the hot water lines and sent down the drain, the cold water is recirculated to the water heater to heat until a control turns it off. This means less wasted water and energy. Be sure you have a range hood that completely covers all the burners on your stove. Unfortunately, in our efforts to improve energy efficiency, many homes are so tightly sealed that the pollutants created while cooking on stoves have led to a growing concern about indoor air quality. Both electric and gas stoves are responsible for the release of fine particles during cooking, with gas stoves generating the worst of the emissions. 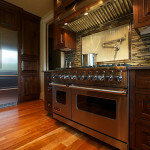 Indoor air quality is a safe and growing kitchen remodeling trend. One way to protect the health of yourself and your family is to ensure good ventilation in your home, especially in the kitchen. To trap cooking fumes right at the source, make sure that you have a range hood that completely covers all of the burners on the stove. Other ventilation solutions to consider during your kitchen remodeling project are windows, ceiling fans and high efficiency exhaust fans. Whatever your home remodeling needs, Designers Northwest has over 30 years of experience in the Portland/Vancouver area, with the skills, resources and technical knowledge necessary to complete every remodeling project to exceed your expectations.